We stand at a critical moment in Earth’s history, a time when humanity must choose its future. As the world becomes increasingly interdependent and fragile, the future at once holds great peril and great promise. To move forward we must recognize that in the midst of a magnificent diversity of cultures and life forms we are one human family and one Earth community with a common destiny. We must join together to bring forth a sustainable global society founded on respect for nature, universal human rights, economic justice, and a culture of peace. Justice – “social justice” as described by Jeremiah Wright, Jim Wallis, and Louis Farrakhan: essentially take from the “rich” give to the poor, but much more. Sustainable development – create artificially high energy costs in order to control travel, communication and food production. Community Life – One World government which will eliminate race, nation and identity and will create a world wide government controlled by elitist decision makers. Diversity – Create a godless society by marginalizing, limiting and criminalizing religious belief, values and speech in order to increase amorality, specifically homosexuality. Economic Justice – the government decides income for everyone. Ecological Integrity – humans are destructive and must be contained and punished, animals and plant life are superior and as an oppressed group must be protected and compensated. Human life must be reduced to protect the environment using any mean necessary, zoning, water rights, food production limitation, population control, abortion, euthanasia, rationing of healthcare resources, ad infinitum. Universal Human Rights – parents no longer have authority over their children, pastors are prohibited from preaching the Gospel, employers are forbidden to have hiring preferences, immorality is exalted, righteousness is regarded as bigoted, intolerant, and prejudiced – forbidden! Read for yourself from this interview at the Ikeda Center, from the Chairman of the Earth Charter Initiative, Steven Rockerfeller, in his own words (emphasis, Gulag Bound’s). Steven C. Rockefeller is professor emeritus of religion at Middlebury College, Vermont. He received his Master of Divinity from Union Theological Seminary in New York City and his Ph.D. in the Philosophy of Religion from Columbia University. Professor Rockefeller is the author of John Dewey: Religious Faith and Democratic Humanism (Columbia, 1991) and co-editor of The Christ and the Bodhisattva (SUNY, 1987) and Spirit and Nature: Why the Environment is a Religious Issue (Beacon, 1992). From 1997 to 2000 he chaired the international Earth Charter drafting committee. He serves as a member of the Earth Charter Commission. Active in the field of philanthropy, Dr. Rockefeller is chairman of the Rockefeller Brothers Fund, a trustee of the Asian Cultural Council, and a member of the Council of the UN University for Peace in Costa Rica. He was interviewed in 2001 by the Center’s Patti Marxsen. PM: What is the Earth Charter and how is it different from existing laws and treaties? SR: The Earth Charter is a declaration of fundamental principles for building a just, sustainable, and peaceful global community. It is a people’s treaty created by civil society under the oversight of an Earth Charter Commission. In the language of the lawyers, it can be described as a soft law document — a statement of widely shared values and aspirations as opposed to an international treaty or hard law document that is legally binding on the nations that adopt it. Soft law documents often do, however, exercise a strong influence on the development of international law. 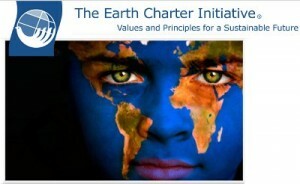 The Earth Charter can be adopted and used by governments as well as by civil society, organizations, and businesses. The document is being circulated to all these groups. A growing number of NGOs have endorsed the document, as have many local governments. For example, the Sierra Club, the World Wide Fund for Nature (WWF), and the U.S. Conference of Mayors have endorsed the Earth Charter. We hope that the UN General Assembly will endorse or in some way recognize the Earth Charter at the World Summit for Sustainable Development in 2002. It is also important to recognize that the Earth Charter contains a more inclusive vision than most international treaties, which tend to focus on a particular issue, such as human rights, biodiversity, or peace. Even though the Earth Charter is centrally concerned about the environment, it was recognized early on in the drafting process that if the document was to gain wide support in both the North and the South, it would have to address issues of human rights and development as well as environmental protection. The Earth Charter affirms the interdependence of the environmental, economic, social, and cultural challenges facing humanity. In this regard it provides a broad integrated vision of sustainable living and sustainable development. PM: You have spoken elsewhere of the importance of intergenerational responsibility. How might the Earth Charter bring generations together and offer an ethical vision that cuts across time? SR: When the World Commission on Environment and Development issued its report, Our Common Future (1987) focusing international attention on the concept of sustainable development, the chair of the Commission, Gro Harlem Brundtland, commented that fundamental to achievement of sustainable development is adoption of an ethic of intergenerational responsibility. Environmental concerns have generated a heightened sense of responsibility with regard to future generations. It is a matter of intergenerational equity. The well-being and rights of future generations provide one compelling reason why sustainable development is essential. PM: You have also spoken about ethics as a path to the development of the self and the expansion of spiritual life. How does the Earth Charter encourage this? SR: There are two different ways of looking at ethics. On the one hand, from the point of view of society, ethics provide a set of values and principles that promote cooperation and the common good. On the other hand, one may approach ethics from a psychological point of view and consider ethics in terms of its significance for the development of the self. Commitment to ethical values promotes the growth of the self because it leads to the identification of the self with the larger community or communities to which one belongs. In this regard, some philosophers like to talk about the democratic self, the ecological self, or the universal self. The Earth Charter ethic encourages us to identify ourselves not only with the human communities of which we are members, but also with the larger community of life of which we are a part. This is implied in the concept of universal responsibility. Under the impact of rapid social and cultural change, there is great moral confusion in the world, and it is very important ecologically, socially, and spiritually that we clarify our moral values. Moral values are the way we define what we choose to be as individuals and as a community. The quality of our lives is shaped by our ethical commitments and decisions. The loss of moral vision and conviction is a very serious matter. The Earth Charter is designed to address this challenge. The decade-long Earth Charter consultation process revealed that people throughout the world are searching for moral direction, and they want to participate in constructing a new moral vision adequate to the challenges of the time. PM: Does the final draft of the Earth Charter provide that kind of ethical and moral vision? SR: The Earth Charter is a product of a global dialogue on fundamental values and principles for sustainable living. It reflects the new consensus on shared values that is taking form in the emerging global civil society. It sets forth the kind of integrated ethical vision that is so urgently needed. However, all of us who worked on the drafting of the Earth Charter recognize that it is not a perfect document and that the global dialogue on common values must continue. The Earth Charter goes far in accomplishing the ethical reorientation necessary, and communities can build on it as they clarify their understanding of sustainable living and implement the vision. PM: The Earth Charter process has been a story in itself. Looking back, what were some of the turning points? SR: The first critical turning point came when the governmental effort to draft an Earth Charter failed. This occurred during the UN Conference on Environment and Development (UNCED) held in Rio de Janeiro in 1992. When the Earth Charter process was started up again in 1994 by Mikhail Gorbachev and Maurice Strong, the secretary general of UNCED, it became a civil society initiative. It did, however, receive some critical financial support at this juncture from Prime Minister Ruud Lubbers and the Dutch government. It is worthy to note that the Earth Charter also intends to create a New World Spirituality as well as a global governance. This found at the International Humanist and Ethical Union (emaphasis, Gulag Bound). The world is divided into diverse ethnic and national communities; each of us has specific moral obligations incumbent on his or her role in these communities. There are, however, basic moral decencies that are commonly recognised as binding in virtually all civilised communities of the world. These ethical principles embody the collective heritage of humankind. They have been tested in the crucible of human experience by their consequences for human good. They include the need to be truthful; to keep our promises; to be sincere, honest, loyal, and dependable; to act with good will; to forbear from injuring other persons and their property; to be beneficent, compassionate, and fair, to show gratitude; to be just, tolerant, and co-operative; and to use peaceful methods to negotiate differences. These ethical principles have all too often been applied selectively only to the members of a cohesive group – whether tribal, ethnic, national, racial or religious. Moreover, competition among groups has often engendered animosity and hatred. It is time that we clearly enunciate these ethical principles so that they may be extended toward all members of the human family living on this planet. The great religions of the past have often preached universal brotherhood. Unfortunately, intolerant or divisive faiths have made this moral ideal almost impossible to implement. Narrow parochial doctrines of salvation have made it difficult for those outside particular denominations to be fully entitled moral consideration from those within. Secular political ideologies have likewise asserted the universality of their ideals, yet they have often resorted to force to impose their views on those who differ with them. PM: Now that the document is written, how do you envision the Earth Charter becoming a living reality? SR: First of all, the Earth Charter is increasingly being used in schools, colleges, and universities as an effective teaching tool. The Earth Charter Secretariat is in the process of preparing Earth Charter teaching resource materials to support use of the document in elementary and secondary schools. In Vermont, for example, the Earth Charter has been integrated into classroom activities in over 40 elementary and high schools, and the Earth Charter is being used in many college courses that deal with environmental ethics, global ethics, and related issues. And this interview took place in 2001. Pesky “universal implementation” — it requires “global governance,” don’cha know. Good thing we have the benefits of such towering intellectual giants as S. Rockerfeller. Lets a feller get things figured out. With such august oversight on God’s plan for global governance, how could a feller ever again get confused? Just hope the feller checked with God to see if God got it right. With all these brilliant new soft laws to pamper ourselves perhaps us fellers can scrub the need for hard laws altogether… I mean, since we’re promised such a cozy one-world utopia. One major problem it appears from here though is that the feller seems oblivious to the fact that global ownership and plans have already been established. In my faith, we are taught that in the pre-earth world, Satan sought to save everyone, and that he wanted God’s glory as compensation. His was an “alternative” to God’s plan. He promised salvation to all without risk. What Satan didn’t tell us — but God did — was that he would do it through coercion. Under Satan’s plan, there would be great promises, but without any choice or freedom. He would do it all through force! When God rejected Satan’s plan, Satan waged a war of rebellion as alluded to in the Book of Revelation in the Bible, and was consequently cast down to earth with those minions who followed him. Now, he and his evil conspirators seek to bring endless human misery to the world by inspiring those who are receptive to their influence that he, Satan, will take care of everything and provide for all, but he still doesn’t reveal the true cost — loss of freedom and coercion at the point of a government gun. Whenever I hear of a group like those sponsoring the “Earth Charter” suggesting that their cause is so just that “the ends (taking care of everyone and everything) justify the means (coercion)”, I know instantly the source of their inspiration. It isn’t divine! Their inspiration source is the same demonic one that has inspired all the tyrants and collectivists throughout history, and who have been the causes of bloodshed and butchery throughout many of those societies in the 20th Century who were their collectivist cousins! Thanks for bringing this tyranny to light! God Bless! I’m very sad to see that a person such as the author of this blog – Janet Smiles – has put up completely distorted information about the Earth Charter, and make a story completely out of context. For example, the concept of Community of Life refers to the notion that we live in this planet in community with other life forms, animals and plants among others. We humans can’t live withouth them, or can we? what would we eat? How would we breath if there are no plants generating oxygen, etc. There is no such thing as one world government, where did you get that..?? On diversity, it is biological diversity what the EC talks about, and also to respect indigenous groups who have been mistreated. On social and economic justice, is to be more JUST – that is what Christianity is all about. Didn’t Jesus asks us to share our goods and be merciful with the poor? It is clear in the Bible, I don’t know why so many so called Christians are against this. I am Christian and of course I endorse this idea. Ecological integrity – of course we need to protect the environment from pollution and mistreatment. we have been doing things wrong in the past 50 years, we as humans should be smart enough to have good quality of life without destroying our home, the only one we have. THERE IS NOTHING ON ABORTION, EUTHANASIA and the rest of topics you mentioned there in the Earth Charter, why lying publicly? And, on human rights, OMG, where this information comes from? It doesn’t make sense what this blog is saying. I think this article (Janet Smiles blog and the video of Dr. Monteith) is a complete lie, and the author should feel ashame of writing lies and confuse people. Remember, that lying and making judgements are sins, and that’s what this author is doing here. you are a “christian” then you have NO NEED for a mere human earth charter. Know what Agenda 21 is? It is promoted by this same United Nations entity that believes that the earth is overpopulated and is a complete LIE. Ever been to Tx or NM or the mountains of Montana, Oregon or Utah etc? You have apparently fallen for their lies. Speaking of human rights? God the Father gave you your rights over all of the animals and over your land here on earth. Do you have that right with this false satanic system that is almost in place here on earth by these UN cretins? A resounding NO is the answer. Your quote:”Remember, that lying and making judgements are sins, and that’s what this author is doing here.” This is why we have the Holy Scriptures of the Bible in order to use discernment using the word of God, as he would NOT have you stay ignorant. Many profess to be christians , but using “extortion” by means of forcing people to be “charitable” does NOT work and throughout history has been a complete and absolute failure. True followers of Jehovah God WILL and ARE giving to the poor and needy without forced coercion and strongarmed tactics! Have you ever wondered why all of the United Nations agencies NEVER give the money collected to their so called “charities” and they NEVER make a difference, but line their own pockets. The vultures who come out 1st in order to help Katrina survivors, Haiti earthquake survivors, etc are always the ones that see an opportunity to gain monetarily. If you wish to be charitable, begin in your own neighborhoods while KNOWING that your efforts of goodwill towards your fellow man will be put to use. NEVER give to universal or national charities. Do a google search on how much money has reached people by any Bob Geldoff or UN donations to the hungry and it should make your blood boil! Want to be a christian, then you will NOT be an endorsing agent to “global government” aka UN that is trying to make the soon coming Savior Jesus Christ just another prophet instead of who HE is. This is an amazing time to be alive and it is up to you to think and to make Judgements using the biblical text, and also up to you to believe with complete faith or not. The decision is yours, but it will not be long until the door will be closed and no amount of knocking will get that door to open up. Peace. This blog is a complete lie, I think Janet Smiles and this Dr. Monteith should feel ashame of posting false information about the Earth Charter, and make a completely distorted story out of it. I wrote a long reply to this but the system kicked me out, so I think people here should go online, search at the Earth Charter site and find the truth about it. I am Christian and have no problems with the Earth Charter.